Mushkin introduces the Atom USB 3.0 flash drive, this stick features a tiny form factor but other than that it doesn't really offer anything extraordinary. The read speeds are OK but the write speeds are shockingly low. The 32GB model offers a write speed of only 21.5MB/s and this drops to a mere 5.5MB/s for the 8GB model, it almost feels like we're back in 2003! The Atom USB 3.0 flash drive emphasizes its convenience with an extremely small form-factor -- just under the size of a quarter. Taking advantage of its small stature, the Atom retains USB 3.0 extreme performance while exercising low power consumption. 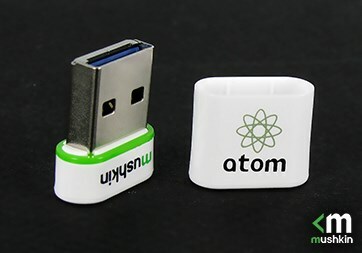 The Atom USB 3.0 flash drive is also backwards compatible with USB 2.0 and 1.1. The 8GB model offers 80MB/s read, 5.5MB/s write, and consumes 0.65W while idle, or 0.905W at load. The 16GB flash drive enables 155MB/s read and 11.5MB/s write on 0.25W idle and 0.67W load. The 32GB model reads at 155MB/s with 21.5MB/s write, and low power consumption of 0.2475W when idle and 0.75W under load.